Hillary Clinton's lead over Donald Trump narrowed to 3 points this week after several days of controversy following FBI Director James Comey's recommendation that no criminal charges be brought against the former secretary over her use of a private email server. While the developments are certainly good news for the Clinton campaign, Comey's critical statement on Clinton's handling of the matter was not positive. Clinton's lead over Trump has deteriorated in the past couple weeks since her lead peaked two weeks ago. A strong majority of voters (82 percent) agreed that it was inappropriate for Clinton to use a personal email server during her tenure as secretary of state. A smaller majority — 56 percent — also said they disagreed with Comey's recommendation that Clinton not be prosecuted for use of the server. 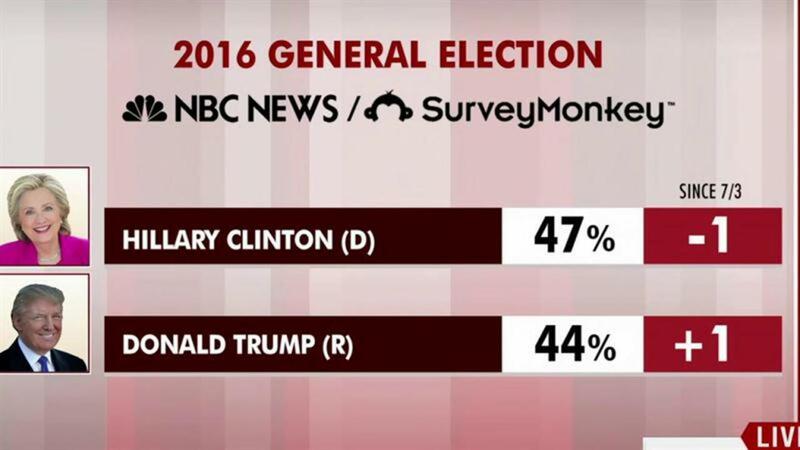 These results are according to the latest from the NBC News|SurveyMonkey Weekly Election Tracking Poll conducted online from July 4 through July 10, 2016. Survey questions pertaining to Clinton's email controversy were added following Comey's announcement. Last Monday, Comey announced the conclusion of the FBI's investigation into Clinton's use of a personal email server during her time as secretary of state. Clinton had been criticized for mishandling classified information and for her administration's reckless treatment of sensitive information. While about eight in 10 of all voters agree that Clinton's use of an email server was "inappropriate," this number also includes nearly seven in 10 of her own supporters. While a majority of American voters (56 percent) disagree with Comey's recommendation that Clinton should not be prosecuted by the Department of Justice, these attitudes break sharply by candidate support. Though Donald Trump's supporters nearly unanimously (93 percent) disagree with the FBI's conclusions, a majority (78 percent) of Clinton's supporters agree that she should not be prosecuted. A notable two in 10 of Clinton's supporters, however, said they disagreed with Comey's decision as well. The email controversy seems to have a meaningful impact on voters' impressions of the presumptive Democratic nominee as 66 percent of voters now say she is not honest and trustworthy — including a third of her own supporters. This issue was a sticking point for many Democrats during her primary campaign run and is often attributed in part to Bernie Sanders' ability to remain somewhat competitive with Clinton. While it is unclear what lasting impacts the investigation could have on her bid for presidency, the email investigation's findings do not appear to have moved Clinton's favorability ratings significantly. When respondents were asked their impression of the Democratic candidate in May, 59 percent of voters said they had either a "somewhat" or "very" unfavorable impression of Clinton. This week, amid intense scrutiny, her disapproval rating is now 60 percent — virtually unchanged since two months ago. 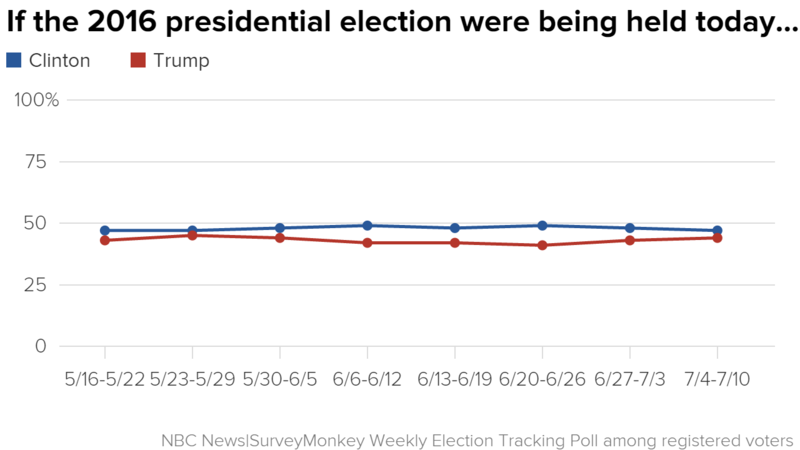 Trump does not appear to have benefited from Clinton's controversy as he also has a 62 percent unfavorable rating this week; identical to his rating among registered voters in May.